Almost seven years have now passed since the fall of Gaddafi’s regime, which has given rise to a situation of “organised chaos” in Libya. Leaders change, alliances change, but state institutions remain weak, confined to a small part of the region and sometimes divided between the Eastern and Western parts of the country, while sub-national affiliations continue to prevail over and prevent the rebuilding of a new legitimacy and national identity. This presents a situation in which illicit trafficking throughout the country – including that of human beings – can proliferate and consolidate. Faced with the difficulty of rebuilding state institutions in Libya, the time has come to question whether the whole political process should be rethought, especially in regard to the actors who have often been excluded or (at least formally) marginalised: the militias. It seems almost useless to recall how the attempts to re-establish Libya’s internal framework in the post-Gaddafi phase have failed to contribute significantly to the pacification, unification and socio-political and institutional consolidation of the country. The reasons behind these failed attempts are complex and largely due to Libya's multiple identities (regionalism, localism, tribalism), its progressive political polarization following the failure of the Arab Spring (Islamists vs. militarists / nationalists), and, above all, because of the disruptive role of international actors (including Europeans), who, in an attempt to have influence on the country, have favoured an internal group at the expense of another. Libya now appears as a patchy composition of hundreds of militias, mainly allied, yet not exclusively, into two coalitions: the first surrounding the Government of National Accord led by Fayez al-Sarraj (wanted by the United Nations); the second surrounding field marshal Khalifa Haftar and the parliament in Tobruk. Given the failure of national reconciliation processes, based exclusively on political or civil figures who have little leverage over those who have real territorial control in the country, many argued that a progressive involvement of armed groups in the negotiations was necessary. However, a comprehensive strategy inclusive of this approach has never been fully developed. The last few decades offer numerous examples of militias, where present, playing a decisive role in national (re)unification processes. Albeit with different characteristics, Afghanistan, Iraq and Somalia, among others, all reveal the deep interactions of militias and armed groups with the state and society. The process and environment, which allow armed groups to emerge and take root, at times extremely quickly, can be difficult to change. Things get even more complicated when the interference of external actors multiplies. Attempting to remove actors with military force that the international community considers illegitimate can lead to the proliferation of armed groups. In Libya, militias are also primarily responsible for the process of industrialisation and concentration of illicit trafficking – including of human beings – which has been seen in recent years. The situation in Libya today is in fact less and less similar to that of 2012-2014, when a larger number of groups competed to expand their influence and control both on the ground and on the management of trafficking . Today, on the contrary, the situation appears to be much clearer in many of the cities along the Tripolitania coast, as the role of some actors has been consolidating to the detriment of others. To draw an economic comparison, this evolution could be defined as a shift from a situation of imperfect competition to one of oligopoly . To convince oneself of the progressive concentration of the trafficking of migrants in Libya, one only needs to look at two things: the distribution of the coastal sites from where migrants are allowed to leave and the long-lasting, sharp drop in departures. From a geographical point of view, until the beginning of 2015 the departures, although concentrated in Tripolitania, were more evenly distributed along the Libyan coast. Since then, they have been concentrated in areas a few stretches of kilometres, west of Tripoli, between Sabratha and the surrounding towns, or immediately east, between Misrata and Gasr Garabulli. In short, the number of places from which migrants leave has reduced, with periods in which only one of the two "trafficking regions" has led the great majority of the flows, as testimony to a continually greater control of the trafficking by certain militias along the west coast . On the temporal front, the long-lasting drop in departures from the Libyan coasts, which has just entered into its thirteenth month (see Fig. 1), indicates that a limited number of actors on the mainland have succeeded in obtaining control of the trafficking, managing over a long time to condition the entity of the departures, as if on tap. Such a sharp and prolonged drop would not be possible in a situation of greater trafficking competitiveness, where, with constant demand to reach Europe, the loss of one player would quickly be replaced by another. Source: elaboration of UNHCR, IOM and Ministry of the Interior data. In public and political debates, there seems to be a lack of awareness of how militias’ involvement can contribute to containing and stabilizing, in the long term, flows from the southern shore. There is also a lack of perception of the urgency and need to involve these actors in a more structured way in the attempt to stabilise the country and make it less penetrable by migration flows that are difficult to control. From this point of view, the attempt to block arrivals in Italy in the past 90 days seems to respond to a short and not a long-term perspective, since it aims at forcing the hand of European partners without, however, tackling the Libyan problem at its roots. An attempt to involve the militias in the reconstruction of the Libyan state has been made but with little success, particularly during the Ali Zeidan period. This was due in particular to the fact that the attempt to integrate the militias into the police or the armed forces remained only a "technical" attempt and not a truly political one. There has been no real disarmament, demobilisation and reintegration programme (DDR) to restore the state's legitimate monopoly on the use of force. In particular, armed groups have been insufficiently incentivised to disarm, for example, by not being offered the prospect of a reintegration process that is not only social and economic for the individual ex-combatant, but also political for the entire group. This has resulted in the militias obtaining a double affiliation: formally they were under the control of the Ministry of Interior or Defence, while informally they continued to belong to the local community that had constituted them and to the political leadership, the war lord or the tribal leader of reference. The narrative often used to describe the issue of armed groups is of little use, since, quite unrealistically, it tends to consider these actors as a single block, rejecting them in their entirety as criminal groups and threats to the state. This view does not take into account the at times broad legitimacy that militias enjoy within their local communities. Actors such as Hezbollah, the Tamil Tigers, the Kosovo Liberation Army and the Irish Republican Army (IRA) have been organised as separate entities from and in opposition to the state, largely as a result of local demands and the grievances of their respective communities. However, at the same time, having established their own parallel institutions, these actors have intentionally assumed the role of “builders” of statehood – even if not over the entire national territory – becoming in fact key interlocutors for the institutions recognised in the peace process of post-conflict societies and of consolidation of their respective nation-states . Furthermore, the exclusion of militias from any negotiations essentially does not take into account the reality that, in several cases, armed non-state actors supplant the state in the provision of services and security. To believe that militias must necessarily play a role in opposing state actors is misleading: if well managed, competition between state actors and others can become in some cases co-options, and militiamen’s actions can strengthen national objectives, for example by countering other militias that are openly “anti-state”. The formal involvement of militias in the negotiations, aimed at transforming them from simple military actors into political actors, should be put back at the core of the attempt at international mediation in Libya. For the time being, the negotiations under the auspices of the UN have avoided doing so, leaving instead external actors with specific interests in the country to deal with the militias, anything but out in the open. Even the most recent mediation efforts have excluded the actors who really hold power in Libya, that is, armed non-state actors. At the end of May, French President Macron invited a number of Libyan politicians to Paris. The “Libya Conference” ended with a declaration shared by the prime minister of the Government of National Accord, al-Sarraj, the President of the House of Representatives of Tobruk, Saleh Issa, the head of the High State Council of Tripoli, Khaled Mishri, and the head of the Libyan National Army, Khalifa Haftar. The four committed to supporting the parliamentary and presidential elections on 10th December 2018 and, prior to the elections, to facilitating the referendum for the approval of the Constitution, together with the issuance of the necessary electoral legislation by 16th September. However, even before the start of the Conference, several militia groups in Tripolitania disassociated themselves from the French initiative. With the return of the political leaders, and al-Sarraj in particular, some militiamen, such as those belonging to the Presidential Guard, withdrew from the institutions whose security they should have guaranteed, sending a clear message of opposition to the Paris Conference, and demonstrating that it is of little use to convene political representatives who have no real representation on the ground, and who sign agreements and make statements that they are unable to implement. Therefore, the attempt to make al-Sarraj the representative of a number of military actors in the capital and Tripolitania appears to be at risk. In the same way, the representation of the militias and of the interests of Misrata also appears to be in crisis after the change in leadership of the High State Council of Tripoli, where at the beginning of April the Misratian Abdulrahman al-Swehli gave way to the aforementioned Khaled Mishri, representative of a political current, the Muslim Brotherhood, and not of a territorial area. The fact that militias have played a fundamental role in the recent systematization of illicit trafficking leads to a second consideration: in order to combat illicit trafficking, the militias must be provided with alternative sources of financing. Serious reflection would therefore be needed on the mechanisms for redistributing the hydrocarbon income in the country. Libya is a rentier state, which bases its revenues almost exclusively on oil and gas sales. We must not forget that, despite the current crisis caused by the instability that followed the fall of Gaddafi, Libya potentially continues to be one of Africa’s richest countries. It therefore makes sense that part of the game involving internal and external actors revolves around the control of hydrocarbons. However, this evidence has not been matched by sufficient discussion of the issue in the course of the negotiations. The issue of how the oil industry should be managed and how revenues should be redistributed within the multiplicity of Libyan actors (municipalities, regions, minorities, ...) has not been adequately discussed, and therefore represents a strong limitation to any negotiation activity, as recently also acknowledged by Mustafa Sanalla, president of the national oil company . Even the sanctions, which impose the unity of Libyan financial institutions , were not sufficient to avoid their division into several parallel entities. Haftar's intention to entrust the LNOC in Benghazi with the right to sell the hydrocarbons of the installations he controls – even though the request did not come to fruition – constitutes a serious threat to the possibility of reaching a united Libya. As far as oil revenues are concerned, there is room to make redistribution smarter and more effective. Redistribution has the power to spread a minimum of well-being and activate productive activities. In the long term, therefore, it could also replace the black economy with formal activities, producing a calming effect on illicit trafficking and making local communities perceive the benefits of the rentier state . It is clear, in this sense, that security and economy must go hand in hand with the process of reconstructing the Libyan state . The recent visit to Libya by the Minister of Foreign Affairs, Enzo Moavero Milanesi, can be understood as an attempt to reactivate a privileged channel with Tripoli, through the bilateral agreement that allowed Italian companies to carry out public works in Libya. This would facilitate the attempt to recreate the connective tissue that has certainly favoured the economic and political penetration of Italy in Libya, and at the same time is increasingly necessary for Libya to get its economy back on track. A few weeks ago, the Italian Prime Minister, Giuseppe Conte, announced that a conference on Libya is currently under preparation that will be held in the fall, and will serve to give an ideal follow-up "to that of Paris, to involve all the actors". During the meeting with President Donald Trump on 30th July, Conte confirmed to its allies that Italy is planning to hold an international conference on Libya. The two leaders announced a cooperation agreement, or a directorship, that would see Italy as a primary interlocutor in tackling the migrant emergency in the Mediterranean and the stabilisation of Libya. Indeed Italy is competing with neighbouring France over how to best deal with Libya. Conte believes a conference in Rome, backed by the United States, will help Rome establish itself as the major interlocutor for Libya’s warring factions. Italy - that managed to stabilise migratory flows under the current political situation - perceives as a risk the next elections in Libya, while France seems to endorse them as a turning point towards stabilisation. As already argued in the past , in order to conduct a negotiation it is necessary that whoever sits at the negotiating table is representative of all the parts of society. It is unthinkable that a table can only provide a place for those who have expressed the will to sit down. In the past, and even more recently, this has led to decisions and agreements (such as those signed by Skhirat) which, however, did not have any real chance of being implemented on the ground. Prime Minister Conte did well to emphasise the intention to involve all the actors who "in whatever capacity can make a contribution", if his reference is interpreted as not limited to the external powers alone. If the words of the negotiations are to be followed by deeds, it is essential to arrive at the conference only after bottom-up preparatory work, including convincing non-state actors that they would have the opportunity to express their positions and political objectives openly at the conference. The conference should aim to find a consensus among as many stakeholders as possible on a few key points of real state building – and especially on the institutional set-up of the new Libya and the distribution of oil revenues across the country. The alternative would inevitably lead to election results that would most likely be the prelude to a new escalation of violence, especially in the event of a vote – whenever it will be – without everyone’s commitment to respect for minorities, political and ethnic, and in a context in which there is still no widespread perception that the new path has been decided together. See the following reports: Frontex, Africa-Frontex Intelligence Community Joint Report 2016, April 2017; e C. Heller, L. Pezzani, and N. Porsia, Blaming the Rescueers, Goldsmiths University of London, 2017. REACH Initiative, “Mixed migration routes and dynamics in Libya: The impact of EU migration measures on mixed migration in Libya”, April 2018. For a theoretical elaboration on the subject see Ranj Alaaldin "Armed Groups, Governance and the Future of the Middle East" in Colombo Magri "Report 2018. Big Powers are Back. What About Europe? ", 2018. The predominant narrative portrays the smuggling of migrants as highly profitable for criminal organisations. On the contrary, data shows that, despite the fact that revenues are concentrated and "unbalanced" towards a small group of people, in Libya their size is not such as to structurally change the local economy, and oil revenues could easily replace the revenues lost from the lack of smuggling of migrants. To give the correct dimensions of the phenomenon, UNODC estimates that in 2016 each migrant paid about 3,000 dollars to leave Libya – see UNODC, Global Study on Smuggling of Migrants, United Nations Publications, June 2018. 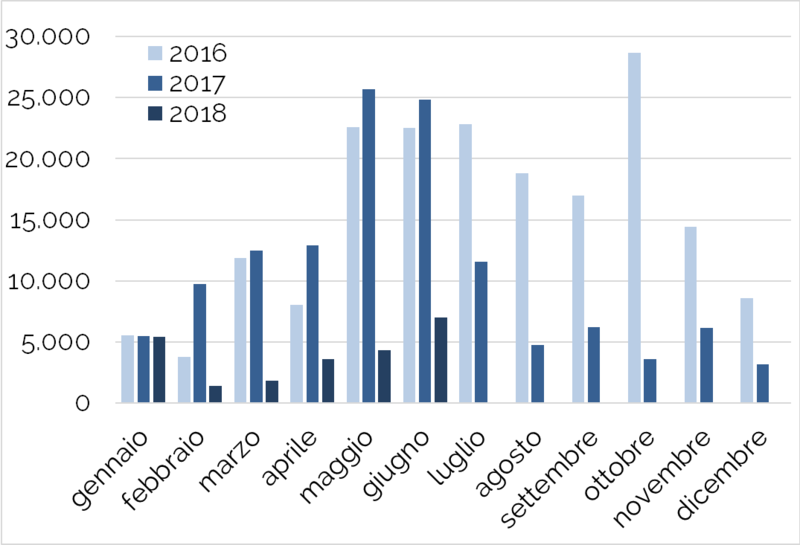 This is equivalent to revenues of about 350 million dollars in 2017 (119,000 people arrived in Italy), and not more than 490 million euros in peak periods (about 162,000 people arrived in Italy in 2016 after leaving Libya). By comparison, assuming oil production of 1 million barrels per day and a barrel price of $72.9 (Brent price on 19 July 2018), current oil revenues would exceed $26.5 billion. In essence, the smuggling of migrants from Libya is “worth” less than 2% of national oil revenues. On the need for an economic agenda for Libya see G. Falco e A. Forni, “Libya Vision 2030: An Economic Development Agenda for Reconciliation”, Milano, ISPI, 28 May 2018. On the subject see A. Sanguini e Arturo Varvelli, “Contribuire alla stabilizzazione della Libia”, Milano, ISPI, 26 February 2018. The views expressed are strictly personal and do not necessarily reflect ISPI's stance.